Ancient Mexico was a place of contrasts, influencing both commercial and ideological interests throughout a much greater region. This is why we don’t talk about just a part without referring to the larger geographic range of Mesoamerica. This was the birthplace of many civilizations. The geopolitical borders which garner so much attention today, did not exist in the prehistoric period and challenges formed from the landscape such as rivers and mountain ranges, proved ineffectual in stemming the diffusion of goods, ideas, and people. The influence of these prehistoric Mesoamerican groups was extensive, stretching over various time periods all the way northward into the American southwest and extending southward into what we currently call Central America. Thousands of years ago, the arts and sciences reached an apex in this part of the world. The development of written forms, the creation of an accurate calendrical system, and the advent of sophisticated mathematical computations permitted the accurate recording of time in terms of solar and lunar observations. Metal was hammered and fabricated into fantastic creative shapes. Stone was culled and hewn into impressive architectural structures, built with such precision and engineering that many survived into the modern era without maintenance for centuries. A claim few of our modern structures will be able to honor. Evidence of human interaction exists, going back a conservative ten thousand years, and that date will likely be pushed back as more artifacts and sites test for earlier occupation dates. Agricultural evidence shows that by 7,000 years ago, people were settling into communities that would one day become the known metropolitan centers of the New World. Mesoamerica was a vast region, but it expressed a level of cultural homogeneity with the cultivation of maize and other food products, the implementation of a singular structure of governance, the use of a standardized calendrical system, the production of monumental architecture, and the shared concept of cosmic duality in both religion and art. These people are believed to be one of México’s first-established distinctly complex cultures. They settled in the Gulf lowlands and had far-reaching influence on later groups who are known to have borrowed heavily from Olmec cultural traditions and artistic conventions. There is still much to learn about the Olmec but already the familiar city temple complexes appear in places like Tenochtitlan, also recognizable are the lines in their artwork. The Olmec are perhaps best known for their colossal stone sculptures. The city-state of Teotihuacán was located on the central highlands of México and covered an area greater than twenty square kilometers. At its zenith, the metropolis reached 200,000 inhabitants, and in the year 350AD counted among the largest cities in the world. Possibly the most highly urbanized center in the New World, Teotihuacan’s religious, political and economic influence expanded into almost all Mesoamerican territory. Occupying the northern regions of the Valley of México, the Toltec reigned with great military prowess. They built Tula, one of México’s most impressive ancient cities and went on to strongly influence the later Mayan and Aztec cultures. The quality of the stone reliefs that decorate Toltec cities clearly are emulated in much later centers built under the rule of differing groups. Everyone knows the Maya controlled a huge empire. Even history books have long credited them with the creation of complex systems of mathematics, adept at making astronomical observations, the use of a fully developed written language and an accurate calendrical system, and notes they were skilled traders involved in long-distance commercial enterprises. The Maya were also master architects and engineers, working in stone and wood, creating ornamented architecture that survives even today. Of all the indigenous cultures of Mesoamerica, the Maya are considered the most influential, with every other Pre-Columbian culture borrowing from them. Established in the Valley of Oaxaca, the Zapotec and Mixtec were superlative builders and artists; creating magnificent temples, pottery, and metal work. Their languages suggest a close relationship but there is ongoing research to differentiate the cultural achievements of either group. Descendants of the ancient Zapotec and Mixtec populations inhabit the State of Oaxaca today, as well as other groups, making this one of the most culturally diverse regions of Mexico today. Thc empire of the Aztec was composed of three different Nahua-speaking groups who settled in the Valley of Mexico and established the main city-state of Tenochtitlán (modern day Mexico City). The empire was huge and powerful when the Spanish arrived in 1519, but by 1521 the region had been largely subjugated by disease and warfare. The contrasting story of these events is told from both perspectives in the codices, and continues to be passed down in the oral tradition of the indigenous populations. Visiting the city allows the visitor a unique opportunity to see ancient Mexico interspersed in the modern day – and this is vitally and vividly true of the thriving Aztec community. Discussing the development and achievements of Mesoamerica is complex because one should take into account the timeline is not only a linear progression but also a cyclic one in nature. Indeed, scholars of Mesoamerica today, both indigenous and otherwise, often struggle to explain the inter-relatedness of sites over extensive periods of time. Generally speaking, Mesoamerica is broken into three time periods. During the Pre-Classic, roughly 2,000BC to 500 AD, nomadic Native populations became sedentary and the first advances in the arts and sciences become clearly evident. Populations increased as agricultural methods improved and rural villages became towns, out of which ceremonial centers grew. 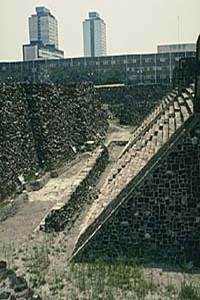 One great example is the City of La Venta of the Olmec culture. The Classic Period, which extended from 500BC to perhaps 800AD, was a time of great social change in Mesoamerica. Urban centers became more powerful than rural ones, spiking some outstanding advances in architecture. This is often referred to as a golden age for art and learning. Some of the best examples include the sites of Teotihuacán, Monte Albán, El Tajín, Palenque, Cobá, Labná, Bonampak, Dzibilchaltún, Kabáh, Sayil, and Chichén Itzá. It is in the Post-Classic Period, from around 800AD to 1521AD, that one notes the increasing emphasis on military rule. This appears to be a time of great change for several important ceremonial centers and cities. Some went into decline, a few disappeared altogether, and only a few grew in power and influence. Best examples of this period include the sites of Cholula, Xochicalco, Tula, Tenayuca, Tenochtitlán (the Aztec City), Yagul, Uxmal and Mitla. Ancient Mesoamerica continued to survive even as the Colonial period enveloped the region and factionalized the land into ever smaller bodies of government rule. Have you considered a walk across Lake Texcoco? Perhaps you’ve considered climbing the steps of a temple to lay your palm on the sacrificial chacmool at the apex? Everyone should walk the Avenue of the Dead between the Pyramid of the Sun and the Pyramid of the Moon…don’t you want to? This entry was posted on February 9, 2012, 3:00 am and is filed under Prehistory. You can follow any responses to this entry through RSS 2.0. You can leave a response, or trackback from your own site. I have to show my daughter this post. She loves this kind of stuff. Great post!! Thanks Jillian! Please do share it – I find it exciting that young people are intrigued with the deep past. More to come. I went to an amazing ancient Meso-America exhibition at LACMA back in the late eighties. We learned about the Aztecs and the Mayans in school, but I never new about the Toltecs and Olmecs until I saw the exhibition, which was arranged in a chronological timeline and took over two hours to view. I bet that was an amazing exhibit. LACMA is such a world-class facility that they negotiate visiting exhibits more readily than smaller facilities. There’s been a literal explosion of information shared via the interwebs in the last two decades. Technology allows researchers to share new data almost instantly and it’s really changing the perceptions we’ve maintained about prehistoric sites. Even publications that are only five years old seem outdated by comparison to the information available now. Good stuff! I learned several new things today. Thanks for posting! This is my second try leaving a response…computer is tempermental today. I’m glad you enjoyed the post, Traci. Thanks for visiting. I love sharing prehistory. The Aztec Beauty above is my image and is copyrighted. Please remove it immediately. I have removed the image per your request. I acquired the image through an archive where it was listed as copyright-free by searching on Google. It was titled “Azteca Dancer” which might help find out how it got listed inappropriately. I’m sorry that happened.